Boston is cold, and there’s finally snow, which I mostly like to enjoy from inside. People wonder how I have been managing the frigid weather. Well, I don’t really have to manage it too much. This past week I think I spent a cumulative of 20 minutes outside, and that’s because I wait outside for 2 minutes for my bus to come. This weather induces my craving for my comfort food. Noodles. They soft and glutenous, so they match my criteria for the perfect food to a T. I am so excited to share this recipe with you all because it’s a noodle recipe! I’m practically typing at the edge of my seat. Aside from Karl, puppies, and clean sheets, there’s nothing I love more than udon. What is udon you ask? It is a delicious round, thick Japanese noodle. It’s made from wheat flour, so how can it not be good? In this recipe, I mix together many simple flavors and lots of different textures. 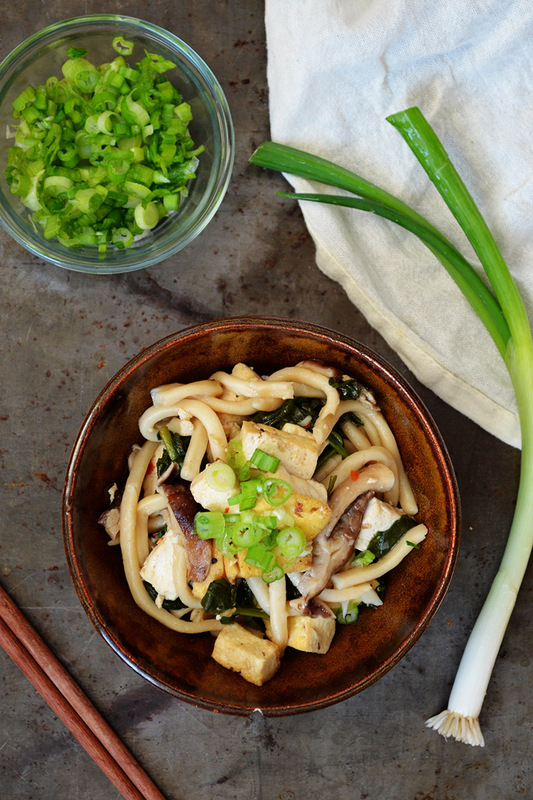 Udon, shiitake mushrooms, and baby spinach are coated in a delicious and flavorful broth, then that’s topped with crispy tofu and the whole shebang is garnished with sliced green onions. This dish is not a soup, and the small amount of broth there is gives it all the flavor it needs. The end result is a big bowl of everything I love, well minus Karl, puppies, and clean sheets. Cook the udon noodles as the label directs (do not overcook!). Drain, and rinse with cold water so they don't stick. Pat the tofu dry with paper towels (the tofu won't brown nicely if it is too moist), then place in a small mixing bowl. Add in ¾ teaspoon salt and ½ teaspoon pepper, gently toss to combine. Heat 1 tablespoon of oil in a medium skillet over medium heat. Add the tofu to the skillet and fry until golden brown, about 4-5 minutes. Plate the tofu and set aside. Add the remaining oil to the skillet, then add the minced garlic. Cook until the garlic turns slightly brown, about 1 minute, then add the shiitake mushrooms. Season with a little salt and pepper. Stir and cook until they're soft, about 3 minutes. Add the red pepper flakes, soy sauce, and sugar. Cook for another 2 minutes. Add the broth and spinach, then bring to a boil. Cook until spinach is wilted, then remove from heat. Add the noodles to the skillet and stir so that they are covered in the broth, then top with tofu and garnish with the sliced green onions. Serve warm. This entry was posted in Entrees and tagged tofu, vegetarian. This looks amazing! I like eating noodles too, and the flavors in this noodle look so good. 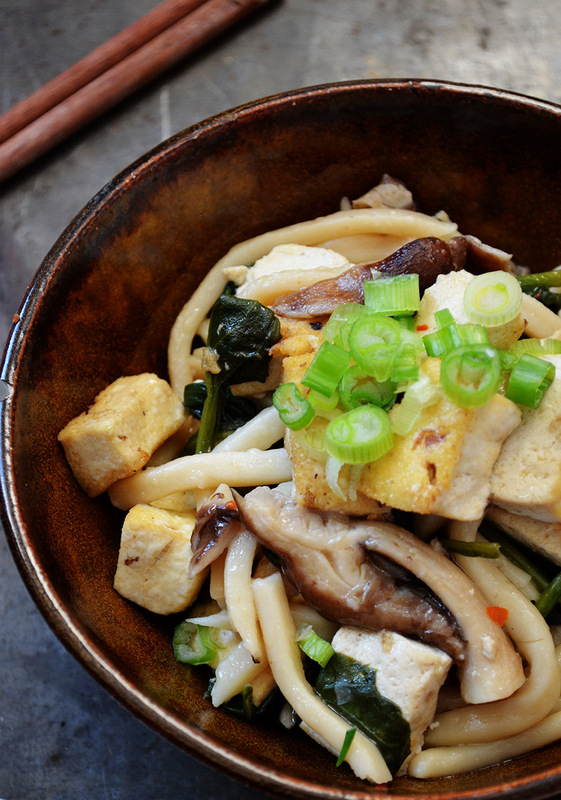 Mushrooms AND tofu in one dish is always a good combination! Noodles are my favorite comfort dish too! This looks like the perfect bowl! Love the spinach, mushrooms and tofu in here! How many servings are here?